This charming gem is found a short drive from downtown Charleston and without a doubt makes the top of my list, when it comes to dining gluten free in Charleston. I have eaten at this dinner restaurant more times than I can count, and each and every experience has exceeded my expectations. The wait staff are always attentive, informed, and professional and the quality of the food never disappoints. Gluten Free options can be found on the main menu and include salads, mussels, coq au vin (chicken), short ribs (The Rib, not the Braised Short Rib), grouper, duck, salmon, and even crab cakes can be catered to celiacs. I never worry about cross contamination here and the restaurant is certified by the Gluten Intolerance Group. Even better, many ingredients and beers (not gluten free, though) are locally sourced. I have to admit, I have only ordered a few items on the menu because they are just that good, but I have dined with many other guests and everyone always has the same reaction – the food is just amazing. In fact it’s so amazing that I was watching “Chopped” on the food channel a few weeks ago and as they introduced the four chefs, I found the Owner and head Chef of the Fat Hen, Fred Neuville, on TV! Menu items range from about $15 – $30, with most coming in right around $22 — seriously cheap for the quality of this food. Of course, the dish I love the most, is the most expensive! Every visit, I order “The Rib” which is a pecan smoked, bbq short rib, served with french fries. I love short ribs. So much so that if it’s on a menu and it is gluten free, I can 99.9% guarantee I’ll be ordering it. The meat is tender and doesn’t affect my gastroparesis, unlike steak,but still provides a similar flavor and fall off the bone wonderfull-ness. This makes me a bit of a short rib snob and… I have never found a short rib that compares to The Rib at the Fat Hen. As if that wasn’t enough, the fries, which are prepared in a safe gluten free fryer, are also amazingly fantastic. Please note: “The Rib” which is short ribs with BBQ sauce and fries are gluten free, however, the Braised Short Ribs with mashed potatoes are NOT gluten free (I’m guessing due to the broth, but have never asked). Guests I have dined with have ordered the Coq Au Vin several times and I really cannot tell you how much I love this dish as well. 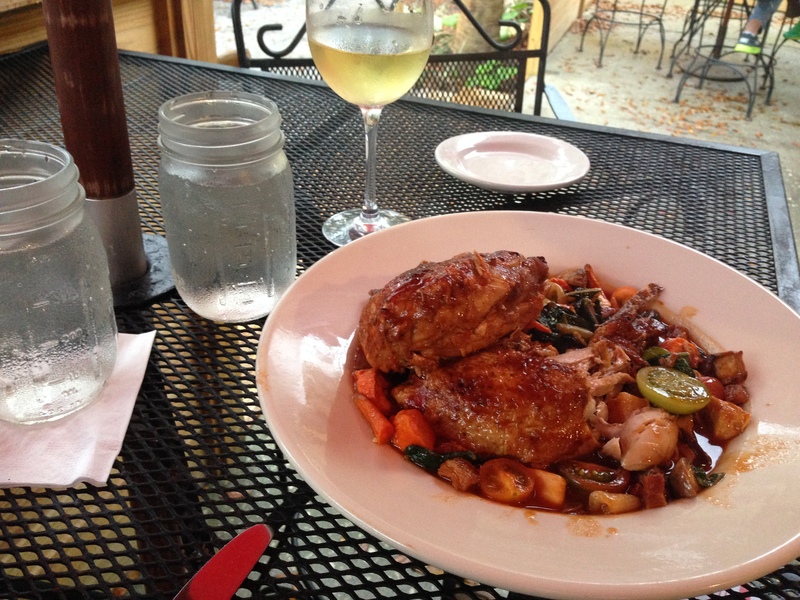 The chicken is always cooked beautifully and the flavors in the chicken and veggies are fantastic. My mom usually orders this dish so I can share and take the leftovers home, but mostly just because she loves it so much. One visit, I ordered the crab cakes. I learned that I definitely do not like crab cakes, but don’t let that deter you from getting them. They are a pretty hard find when it comes to gluten free and are definitely worth trying if you like crab cakes! Be sure to ask for gluten-free cakes, as the menu does change from time to time. The food is coined “Lowcountry French Cuisine” probably because nearly everything in Charleston uses the tagline “low country.” The water is served in mason jars and the menu boasts crab soup,fried shrimp, and shrimp and grits. You can even order a “lowcountry lemonade” cocktail with sweet tea vodka. It is probably the only place you will find pomme frites alongside bacon cheese grits on a list of sides. The restaurant did not used to take reservations for less than 6, but now it looks like they do! Call to make a reservation, or find them on OpenTable. I highly recommend making a reservation, since it does stay busy. They have about 5 tables outside and if the weather is nice, it is really nice to sit outside, where it’s quieter. Be warned: the mosquitoes will “getcha” in the summer months! If you do find yourself waiting for a table, they have recently opened “the coop” (wow, so cute!) where we enjoyed live music and an outdoor bar, to grab a drink and enjoy life on the island. You can also find them at brunch on Sundays for butternut squash rice, crab cakes, eggs, or salad. 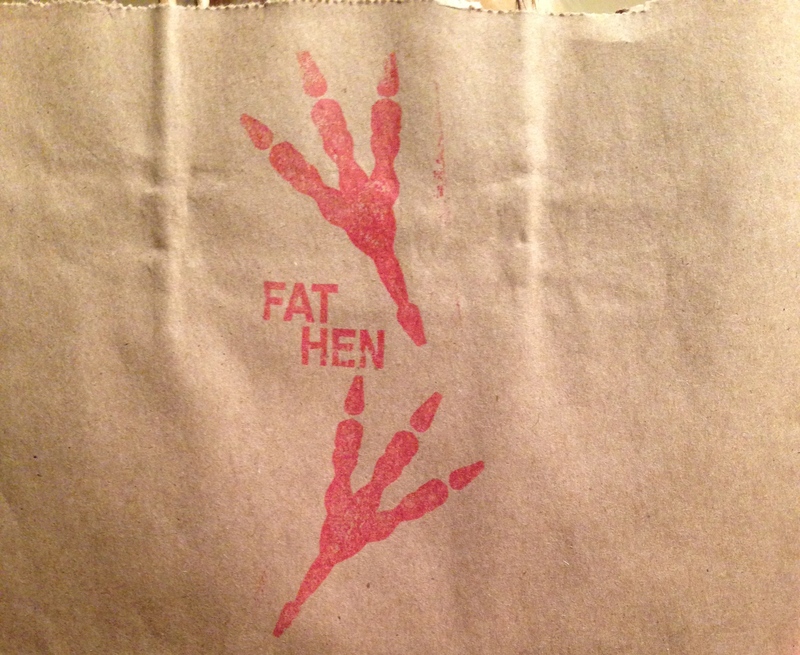 If you are visiting Charleston and have the ability to drive somewhere outside of downtown, don’t even think twice about the decision to eat at the Fat Hen. I promise you won’t regret it.